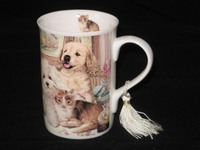 Four delightful designs to choose from in this range. 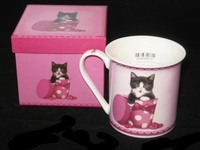 Each mug is beautifully packaged in a matching box. 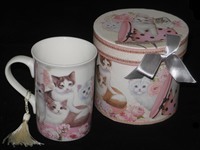 Perfect for that special gift. 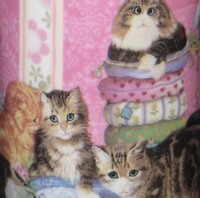 Matching Mouse Pad is available. 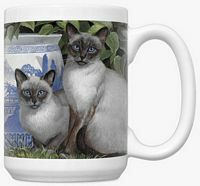 Price quoted is for 1 Ceramic Peeping Toms Mug. 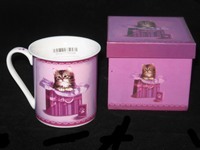 Price quoted is for 1 Ceramic China Blue Mug. 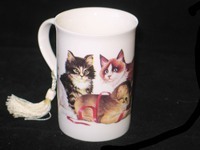 Price quoted is for 1 Kitkat and Boots Mug. 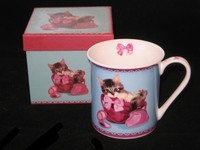 Price quoted is for 1 Ceramic Buggy and Juliette Mug. 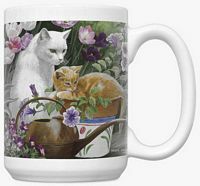 The First Spring Mug is a delightful and colourful cat themed mug. 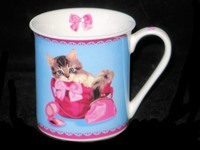 The perfect gift for someone special or pamper yourself. 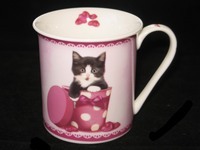 Quite a heavy ceramic mug, which ensures your coffee or hot chocolate stays warmer longer. 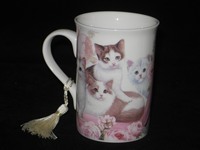 Price quoted is for 1 Ceramic First Spring Mug. 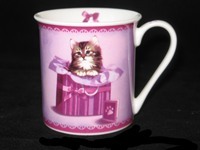 Add a touch of class to your kitchen with this beautifully designed ceramic mug. 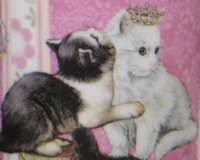 Artwork is by Adeline Halvorson. 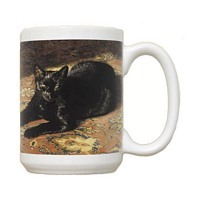 This is a gorgeous Black Cat Mug. 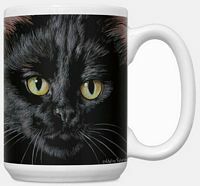 Price quoted is for 1 Ceramic Black Cat Mug. 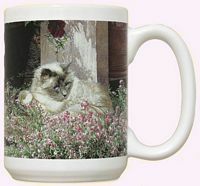 Price quoted is for 1 Sweet Alyssum Mug. 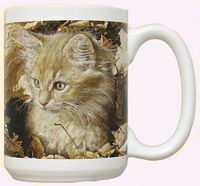 Price quoted is for 1 Ceramic Amber's First Autumn Mug. 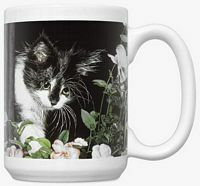 Ceramic Black inside Funky unique handle. 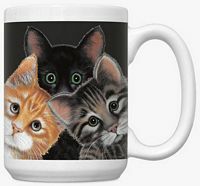 From the makers of the Britto collection, comes Retroflection. 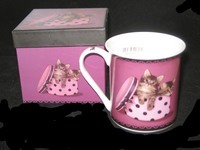 A range of retro-inspired ceramic tabletop pieces and giftware items for lovers of all things retro and vintage. 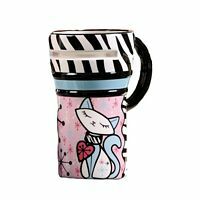 Ceramic travel mug with a retro blue cat design. 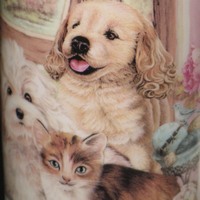 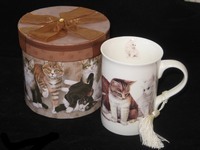 This delightful ceramic mug decorated with gorgeous cats playing it comes gift boxed in a round matching sturdy cardboard container. 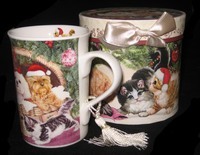 The gift box is decorated with the same cats and finished with a light brown lid and a matching ribbon with an imitation ruby in the centre of the bow. 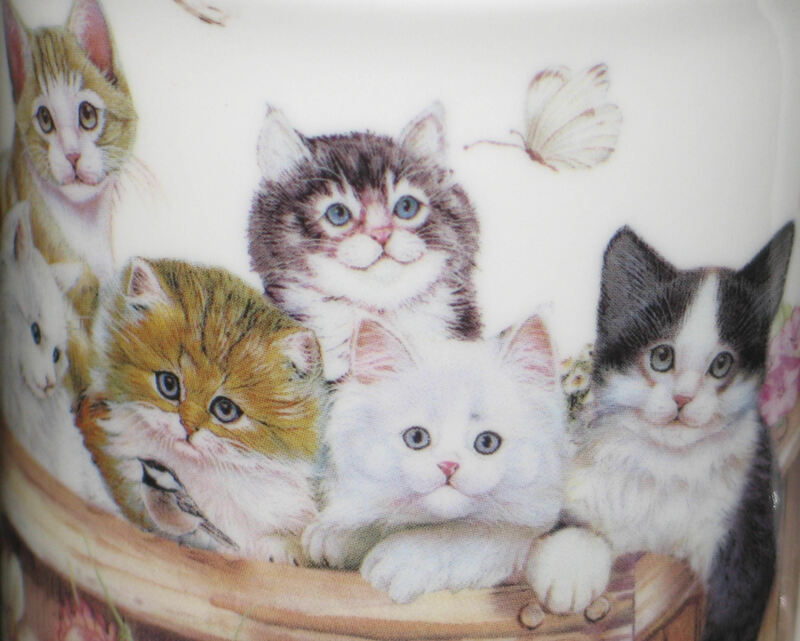 Approximately 11cm high and 7.5cm diameter. 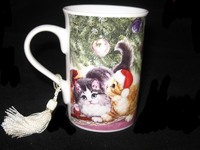 Price quoted is for 1 Reflection Cat Mug Gift Set. 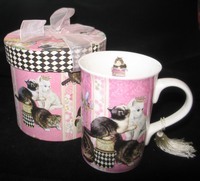 The Peeping Felines Snack Set includes both the mug and the tray. 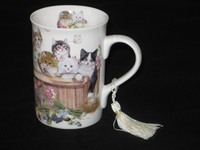 Beautiful Bone China Tiger Mug from the Wild Collection. 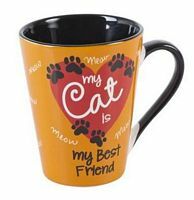 A classic shape, this mug is made out of lightweight yet strong bone china, which has a magical way of making your steaming beverage simply taste better. 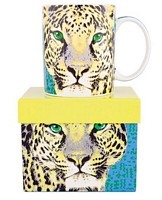 Part of the Wild Collection from Ashdene, this mug pays homage to the fascinating wild animals that roam our planet. 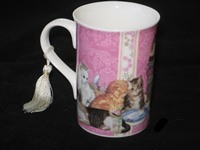 Price quoted is for 1 Bone China Tiger Mug. 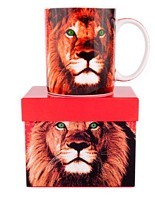 Beautiful Bone China Lion Mug from the Wild Collection. 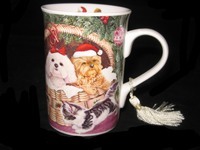 Price quoted is for 1 Bone China Lion Mug. 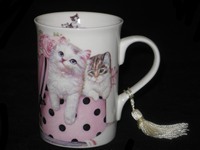 Beautiful Bone China Leopard Mug from the Wild Collection. 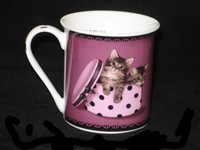 Price quoted is for 1 Bone China Leopard Mug.